Hofstra Student Life: The First Years Get Their Turn! The First Years Get Their Turn! Celebration! This now annual event was hosted by the Center for University Advisement for all First Year students wanting to register for spring 2012. The doors opened at 10:00 p.m. and by 10:45 the cafe' was packed. Volunteers from the Center for University Advisement were happily providing Alternate PIN's to previously advised students and offering last minute advice on course selection for those still in need. Also on hand this year to assist students were Teri Cox, Director of Student Financial Services, Professor Terry Godlove, Senior Associate Dean for First-Year Programs, Jessica Havery, Resident Director of the Netherlands, and Christopher Muller, Director of Residential Living Learning Communities, along with a multitude of upper class volunteers. 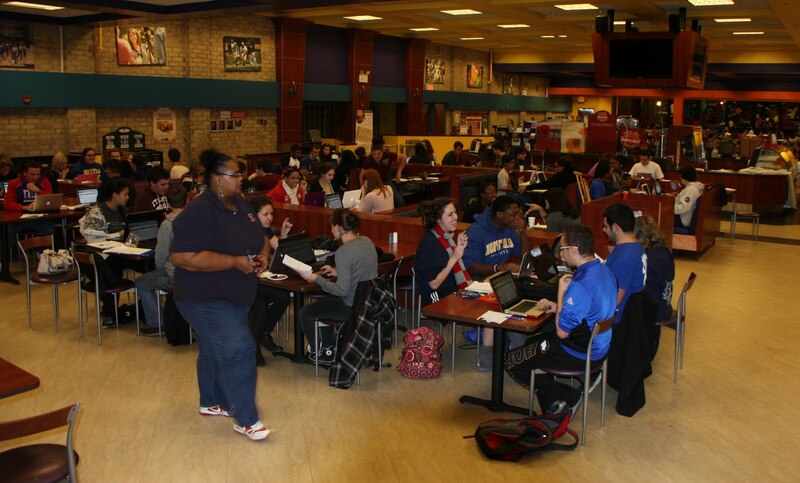 The hot cocoa flowed and music blasted as students crowded tables with laptops and waited on pins & needles for the clock to chime 12:01 a.m. so they could quickly press the "submit" button to see if they would successfully complete their mission of getting into their most desired classes. R.A.'s and last summer's O.L. 's had a good time sharing their top secret tips on how best to register with their fellow future alum. 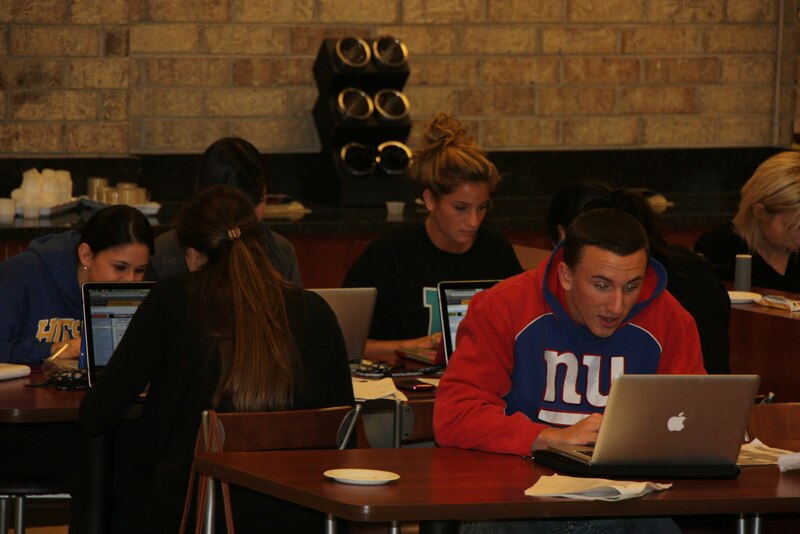 By 1:00 a.m. the majority of our First Year class had successfully completed their spring 2012 registration mission! Some managed to get all of their 1st round picks, others weren't so happy, but needless to say, everyone was relieved that they now had access to make their schedules and look forward to another great semester! Kudos to everyone that made this exciting event a success - especially the students that brought their great spirit and enthusiasm! Welcome Back Hofstra Cheer & Dance Alumni! "Shake A Rake" A Huge Success! Presidential Debate Returns to Hofstra! It’s Never too Late to Get Involved!